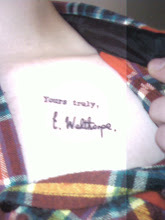 Yours Truly, Edna Welthorpe: This is the dawning of the age of...the internet musical? This is the dawning of the age of...the internet musical? I have been thinking a great deal lately about the internet. Good timing, right? I might be a good decade or so behind the 8 Ball on this one. All the same, my musings are not entirely untimely when you take the current recession into consideration. With little to no money to spare, many of us who would rather be sitting in on live performances have had to resort to other media for our doses of modern performance. Whether it be watching clips from the Tony Awards on YouTube or catching up with Mary Louise Parker's latest antics on Weeds, we have all had to adjust to new budgets that don't leave room for weekly trips to the theatre. 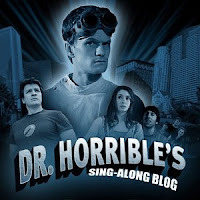 A few days ago, a good friend e-mailed me a link to CollegeHumor's new online musical "Web Site Story". This short video (obviously) draws from the classic musical West Side Story not only for its name, but also loosely as the basis for its plot. Tony and Maria meet online (after Tony comes across Maria's Twitter updates via Facebook) and the two plan a romantic meeting. All that they know about eachother comes from their respective online haunts and profiles: Tony knows that Maria is an avid fan of Jason Mraz and he sings a song (to the tune of "Maria") in praise of Pandora, which allows him to "educate himself" in the ways of such devotees. Maria's friends (in a scene directly reminiscent of "I Feel Pretty") sing about the joys of Twitter, which allows everybody to know what she is doing at every moment of the day. Other popular internet phenomena that are touched on include the popular dating website eHarmony, Google Earth and e-vites. Tony and Maria even admit to the excitement of blogging about one another after their date is over. While the video certainly makes fun of all of the aforementioned forms of "communication", it also is targeted at exactly those people who have made such forms as prominent as they are. The friend who sent me the link is a complete computer junkie who most likely came across this project via somebody's "tweeting". It is interesting that the form of the musical has translated so popularly to both video and the internet (see also things such as the web series The Battery's Down and Joss Whedon's Dr. Horrible's Sing-Along Blog). "Web Site Story" appeals to very different crowds of people: those who are (to quote a friend) "married to the internet" and theatre junkies such as myself who are more interested in the reshaping of classic work and forms for a contemporary audience and, specifically, this generation. What does this say about the future of the musical? While such an overwhelming amount of what is being staged is either a film adaptation or a jukebox musical (for example the upcoming Spider Man Turn Off the Dark or American Idiot), is it necessarily a negative thing that young people are taking advantage of more modern resources in order to reimagine what this form can mean to a generation so plagued by moment to moment updating and instant gratification? I am certainly a life-long proponent of live performance and musical theatre proper, but at a time when resources are scarce and producing a successful original work is becoming increasingly difficult is it a negative thing to find an alternative route to creation? The material is certainly topical and original, if nothing else. So, I end these scattered musings on a note of uncertainty. Are internet musicals effectively destroying the future of musical theatre or simply providing an outlet for a generation that has clung to a new form of communication and expression? I always say I'm making out with the internet. Maybe it's time to quit the shenanigans, settle down, and get married.